Last summer, Marvel managed to win back the rights of Spider-Man so that the character could be included in Captain America: Civil War. For that movie, Tom Holland was cast in the role. 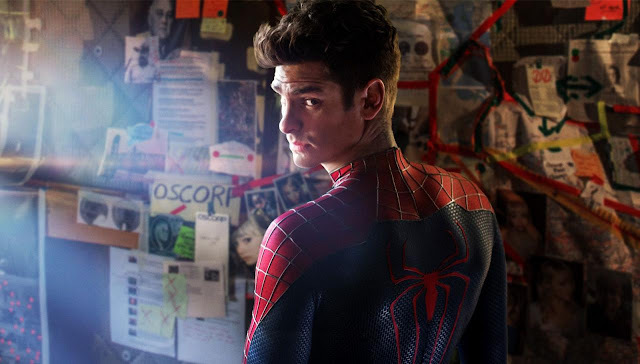 However, this unfortunately meant that Andrew Garfield would no longer be able to keep the part or continue The Amazing Spider-Man franchise. Why is this? I still don't know. And I'm still very sad about it. Here are five reasons why. Let's just get the obvious out of the way. As Peter Parker and as himself, Andrew Garfield brings a certain charm to everything he does. While undertaking the role of Spider-Man was a huge amount of pressure which eventually affected him, Andrew was incredibly excited to take on the role. Ultimately, Andrew Garfield is just a fan of Spider-Man just like any of us. This was proven by his introduction of Spider-Man at the 2011 Comic Con. You can read and watch his awesome, impassioned speech here. "...And Peter Parker has inspired me to feel stronger. He made me, Andrew, braver. He reassured me that by doing the right thing, it's worth it, it's worth the struggle, it's worth the pain, it's worth even the tears, the bruises and the blood." As a fan of Peter Parker and Spider-Man, Andrew was able to understand his character and play him well. It's clear from his speech above as well as the nuanced portrayal of Peter Parker in the movies that Andrew understood Peter Parker very well and put a lot of thought into his portrayal. Not only that, but he gets what it's like to be a fan of a character, and he respected that when portraying Spider-Man. As a fan of many things myself, that means a lot to me. In the previous Spider-Man movies, my love for Peter and Mary Jane was kind of hit or miss. Not so with Peter and Gwen. Even though I knew from the beginning that the relationship would end tragically, that didn't stop it from being one of my favorite fictional relationships ever. I have to give Andrew Garfield and Emma Stone major kudos for that. The reason Spider-Man is so relatable is because he's normal. He's nerdy. He's in high school. And he's not prepared at all to be a superhero. I love confident heroes (aka Tony Stark) a ton, but something about Peter Parker's boy-next-door nature really appeals to me and to a lot of superhero fans as well. Even though Andrew wasn't in high school and started to age out of the part by The Amazing Spider-Man 2, he still managed to give life to Peter Parker in a way that I really appreciated. In the end, Andrew Garfield portrayed Peter Parker exactly as he should be: lovable, endearing, and more than just a little unsure of how to be a hero. That's something I'll be thankful for for a long time and will forever miss about Andrew Garfield as Spider-Man. We miss you, Andrew Garfield! Thanks for everything. What about you? What will you miss most about Andrew Garfield as Spider-Man?